This is the best healthy zucchini bread — it’s packed with flavor and made with tons of healthy ingredient swaps. This healthy zucchini bread with yogurt can be made with or without chocolate chips and/or nuts! 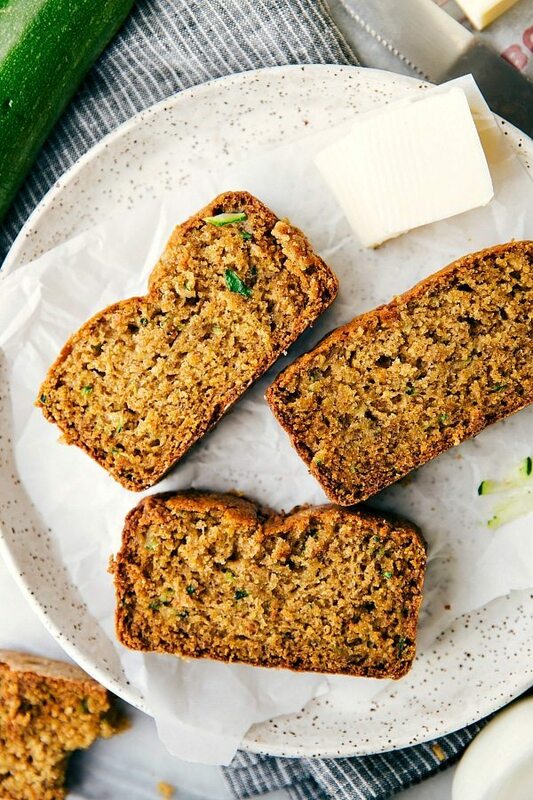 After you’ve tried this healthy zucchini bread, you’re going to want this healthy banana bread, healthy pumpkin bread, and healthy lemon zucchini bread next! Or if you’re a big chocolate fan, you’ll want to also try my Healthy Chocolate Zucchini Bread recipe. Zucchini bread has always been a favorite of mine. I love it so much that we even served it at our wedding. My mom, sisters, and I spent days making zucchini bread in miniature bread tins and then freezing it for the big day! My mom has a zucchini bread recipe that is pretty much famous. People ask her for it all the time and the husband goes nuts over it every time I make it. I shared that zucchini bread here. However, if you look at that recipe you may notice that it is purely a dessert called a bread. It’s packed with sugars and oil and the only health-wise redeeming factor of it is the actual zucchini. Not that there is anything necessarily wrong with that because it is one of my favorite desserts ever and I will continue to make that every single summer! But that bread is a dessert. And as a dessert, it’s not something I want to eat everyday. But this bread? It’s aimed towards being a bread you won’t feel bad about eating for breakfast or snacking on all throughout zucchini season. I am so excited for you to try this healthy zucchini bread because it is so tasty, but also it’s such a healthier zucchini bread recipe. No, you do not need to peel the zucchini! The skin adds to the texture of the bread, and once cooked into the zucchini bread, you won’t be able to taste it. How do I cut zucchini for bread? Use a regular sized cheese grater to grate the zucchini. If using a large zucchini, you may want to first cut the zucchini in half horizontally. How many cups of zucchini do you need for zucchini bread? This easy healthy zucchini bread recipe calls for one cup of shredded zucchini. 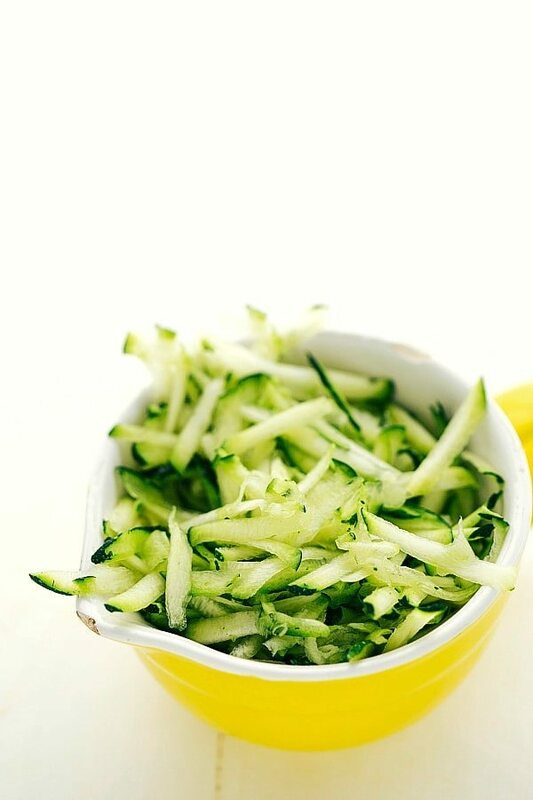 One medium zucchini should make approximately one cup of shredded zucchini. Use organic eggs – The large organic eggs are slightly larger than “regular” large eggs. The larger egg is going to make this bread even more moist. Also if you ever compare an organic egg yolk to a regular egg yolk, the yellows are very different in color. The yellower, organic egg yolk is going to make this bread more flavorful. I’ve tried both eggs and taste testers can tell a difference! Use a ripe banana – the mashed-up banana in this recipe helps with binding the bread as well as the sweetness. The riper your banana is, the sweeter the result will be. Mash them up really well and you shouldn’t be able to taste the banana at all in this recipe. Can I make this zucchini bread into muffins? Healthy zucchini bread muffins make a delicious, fun breakfast and snack. While this particular recipe doesn’t convert perfectly to muffins, I have created a similar recipe that makes the perfect healthy muffins. Click here to try my Healthy Zucchini Muffins. How healthy is zucchini bread? 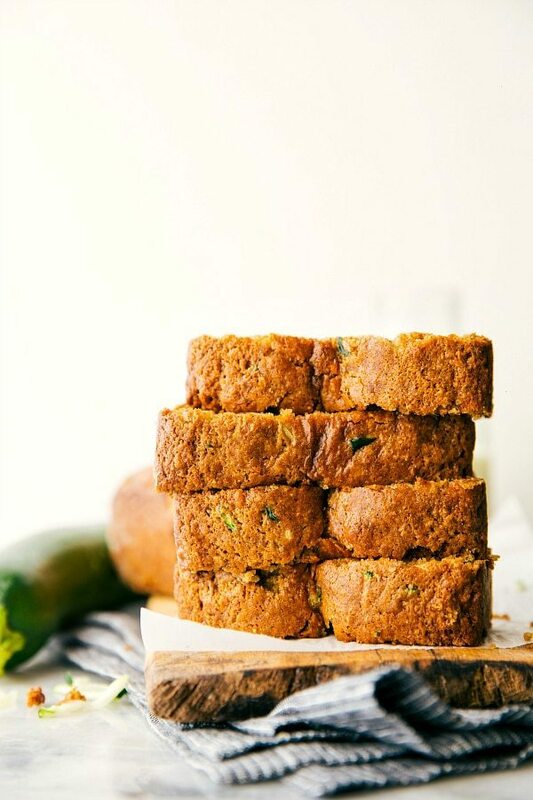 I’ve been asked several times, “Is zucchini bread good for you?” Traditional zucchini bread is not typically healthy, as it generally has a lot of sugar and unhealthy oils, and is more of a dessert than a breakfast/healthy snack. 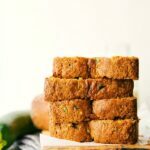 This moist healthy zucchini bread recipe takes out a lot of these unhealthy ingredients and replaces them with good-for-you ingredients including Greek yogurt, banana, oat flour, and coconut oil, making it a much healthier bread that you don’t have to feel guilty about enjoying! How can I freeze zucchini bread? Let the zucchini bread cool completely. Wrap the uncut loaf with plastic wrap and place into a freezer bag. For best quality, consume within 2 months. You can also freeze shredded zucchini in a freezer bag so you have zucchini on hand whenever you want to make this easy healthy zucchini bread recipe! How long does zucchini bread last? 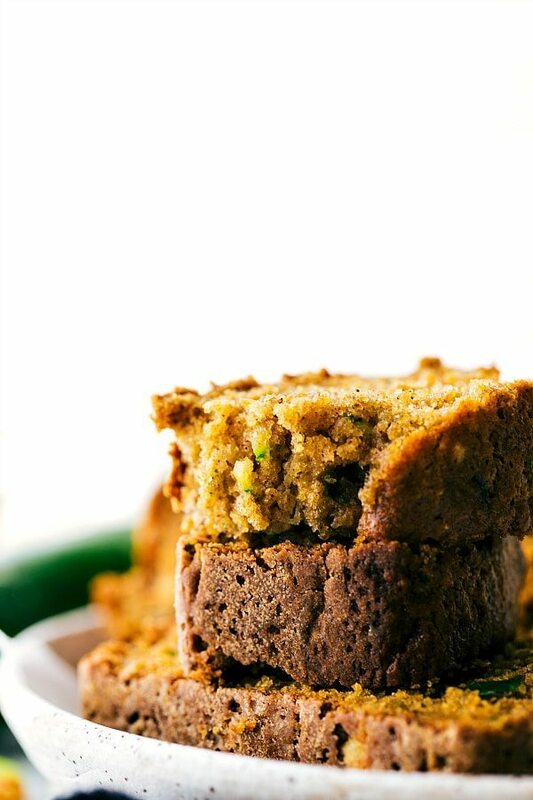 Stored at room temperature, zucchini bread should stay fresh for 1-2 days. Stored in the fridge, it should remain good for up to a week. When stored in the freezer, it can remain fresh for up to two months. This is the best healthy zucchini bread -- it's packed with flavor and made with tons of healthy ingredient swaps. This healthy zucchini bread with yogurt can be made with or without chocolate chips and/or nuts! Preheat the oven to 325 degrees F. Lightly grease and flour one bread pan and set aside. I use an 8 and 1/2 x 4 and 1/2 bread pan. In a bowl, stir together the Greek yogurt, vanilla extract, 1 large egg, coconut oil (measured when melted), and honey. In a small bowl, mash the banana really well. The banana is very important for binding of the bread and a healthier sweetener. The more ripe - the better. In a separate bowl, stir together the oat flour (measured AFTER blending. I used regular old fashioned or quick oats and quickly pulse them in a blender or food processor until they resemble flour. Then measure and add to the bowl), white or white-whole wheat flour, baking soda, salt, and cinnamon. Stir in the grated zucchini and chocolate chips or nuts if desired. Pour the mixture into the prepared pan and top with more chocolate chips if desired. I have a lot of explanations for the particular ingredients used throughout the text in this post. Before making substitutions (even "tried and true" ones) read the text or ask a question in the comment section. There are also some tips throughout the post that will help you make this bread! This is really healthy bread! Looks moist and yummy! Made this recipe this morning…… absolutely fabulous, thank you so much! I haven’t had zucchini bread in such a long time, so I’m totally craving it now! This looks fantastic, Chelsea! Love the greek yogurt in here. Pinned! Wow, Chelsea, this bread looks AMAZING! I’m favoriting it so I can make it this weekend! The use of ZUCCHINI in this bread – YES! Friggin’ LOVE IT. I think I am going to incorporate Zucchini in one of my up coming recipes for sure! Ah yes, it is zucchini bread season!!! I love zucchini bread, and it has to be full of chocolate chips just like yours is! This looks awesome!! That’s the prettiest way to use zucchini that I’ve seen all day. What a delicious quick bread this is! Love that this is healthy and has chocolate in it! Win-win! This zucchini bread is gorgeous, Chelsea! I love all the healthier substitutes you used! It looks so moist and delicious and the chocolate chips make this even more special! <3 it! I love that you served zucchini bread at your wedding!!! I’m sure this healthy version will get made a lot in my house this Summer! This loaf is in my oven right now and it’s my first ever zucchini bread! Can’t wait to see my dad’s reaction when he discovers I stuffed his afternoon snack full of green goodness. I made this recipe today (doubled it), and the only change I made was to use half whole wheat flour, and half all-purpose. Awesome bread! I had some very ripe bananas, so it worked out perfect to use a big zucchini from the garden with it. I was wondering if I could substitute coconut palm sugar for the brown sugar next time. Awesome! So glad you enjoyed this! And glad it worked well with the different flours 🙂 I’m not sure on that sugar substitute as I haven’t tried it for this recipe and don’t have tons of baking experience with coconut palm sugar. Sorry to not be of more help! If you do try it, I’d love to hear the results! I have made this 3-4 times and substitute 1/2 cup coconut sugar for brown sugar each time I make it. I love it and I have received raving reviews about the bread. Of course, I referenced back to this link and explained the changes I made to the recipe. I hope that helps in your future baking. Made this last night and doubled the recipe so I could ship some off to my son and bring some into work. It was perfect!! I used Splenda brown sugar, fat-free Fage greek yogurt, and added 1 tsp of baking powder because I always think that will prevent it from being too flat. Made one batch as muffins and one batch in 7X11 (I think) baking dish. Again, is was perfect and everyone loved it and asked for my recipe. My garden is bursting with zucchinis so I made this bread for the first time today. Holy Zucchini! It’s delicious!!! My picky little rascals loved it and my picky husband loved it, (minus the chocolate chips in his loaf). It’s so good, thank you for sharing. Haha!! “Holy Zucchini” — so glad you enjoyed this bread 🙂 Thanks so much for the comment! This recipe looks great. I have a TON of zucchini and was wondering how you thought it would change the recipe if I added a cup and a half of zucchini (or more?) instead of just a cup? I’m not quite sure since I haven’t tried it. I always say it’s best to stick to the recipe since that has been tested. However, it may work and be great 🙂 Sorry to not be of more help! Please let me know if you end up trying something different! Nice recipe! Making it a second time and doubling the batch. I used grapeseed oil since I didn’t have any coconut oil. For try #2 I’m going to make muffins instead of bread, b/c I have monster size zucchinis and super mushy bananas, which I believe made it overly moist the first time… took forever to cook through. That said I’m thrilled about this recipe and spouse loved it too. Lovely. It was moist and delicious. Did not have dark chocolate so I used milk. I will be buy dark to make this again! Do you have any nutritional information on it? So great to hear! Thanks for the comment Shawn! 🙂 I don’t have nutritional information for this bread right now. I’ll work on getting it! I absolutely LOVED this recipe. Very easy and pretty full proof with all of your comments and hints:) I did it without the chocolate. Yay!!! So glad to hear it 🙂 Thanks for your comment Angie! Hey Stephanie! I haven’t tried this bread with regular yogurt I can’t say for sure. Greek yogurt tends to be thicker and creamier than regular so it may affect the taste and even the texture slightly if you switch. That said, I think it should work okay. Sorry to not be of more help! What would be the bake time if I made this into muffins? Would it make 12 muffins? Also, would it be ok to add some frozen blueberries instead of chocolate chips? If I only used 1/4c coconut oil, would I need to make any adjustments? I have tried other recipes using 1/3c and I find them to be too oily feeling. Also, do you need the sweetness of the vanilla yogurt, or just the vanilla flavor (if I were to sub plain greek and a little extra vanilla extract)? I haven’t tried making this recipe into muffins so I can’t say for sure. I do, however, have two other zucchini muffin recipes on my blog if you search in the search bar for them they will come up 🙂 I’m also haven’t tried any of your other adjustments so I really can’t say for sure how they will work out. The frozen blueberries should be okay but you will likely have a much moister bread (I would think fresh berries would do better). I can’t say what would happen if you reduce the coconut oil as I haven’t tried it with only 1/4 cup. And the plain Greek yogurt should be okay but I do think the vanilla Greek yogurt adds a lot of sweetness and flavor (more than vanilla extract adds). Sorry to not be of more help! Hey Robin! Thanks SO much for coming back and sharing with others what you tried — I’m sure there are many that will be grateful! So glad they worked and were delicious — I love the idea of doing blueberries with the zucchini! I made these a couple of weeks ago and have been wanting to make more ever since. They were delicious and I am not always one to try something new but trying to be a little more adventurous. I used oat bran and half whole wheat and half white flour and again they were delicious, moist and love the fact that they have just some chocolate to help my sweet tooth. I also made them into mini loaves instead of one large loaf. thanks for the recipe and look forward to finding more treats on your site. Thanks for the recipe! I made it with plain greek yogurt and I added half a vanilla bean. I used dark chocolate chunks and it came out great! My banana had been previously frozen, so was maybe a little more watery that fresh banana would be. I made a second loaf without chocolate, also adding half a vanilla bean. Instead of using 1/2 cup brown sugar, I did a 1/4 cup plus 2 tablespoons of maple syrup. I also added about a tsp of freshly grated nutmeg. Baked 47 mins. This was SUPER moist and fell apart a tiny bit coming out of the pan, but I think that was because I didn’t grease it well enough. If you’re looking to make the bread less sweet, but still full of flavor, these substitutions worked out well. Thanks so much for leaving a comment Christina! And especially thank you for sharing your substitutions that worked well 🙂 I appreciate it as I’m sure many other readers will too! Glad you enjoyed this bread! Can I substitute coconut sugar for brown sugar? What if I use plain Greek yogurt? Will it lack a lot of taste? Awesome recipe, thanks for sharing! Love, love that there’s no vegetable oil in it. I’m making it now and wondering if almond flour could be substituted for the oat flour? Thank you! ? I made your recipe with no substitutions. It’s amazing. Everyone loves it! Can you please tell me how to make it with the cream cheese swirl???? I love cream cheese : ) Thank you. Outstanding! My teenage boys gobbled this up. Found you on the web, you have created a devotee with just one recipe. Can’t wait to see what else you have. Oh YAY!! So great to hear!! 🙂 Thank you Elyse! I tried this recipe over the weekend because it looks phenomenal! I followed the recipe exactly and my bread tasted great, but didn’t quite bind. It was very moist and wouldn’t hold together when I tried to slice it. I want to try this again and hopefully have it come out right. Any suggestions? I would recommend *thoroughly* drying out the zucchini before adding it in as that is probably the reason it was so moist. You also could add some more flour or make sure that when you measure your flour the measuring cups are completely filled to the top and not loosely measured 🙂 It could also just be an altitude issue and perhaps a longer baking time could help. I hope these ideas help 🙂 Thanks for the comment! I loved this recipe! I didn’t have any bananas in my house, but I did have applesauce. To hold the bread together without the banana I put in 2 tablespoons applesauce and 1 tablespoon egg whites. The bread turned out so fluffy and light! I will definitely be making this one again!! Yay! So glad to hear you loved this! And great idea to use some more applesauce and egg whites 🙂 Thanks for the comment!! Oh this comment makes me so happy!!! I am thrilled you enjoyed this bread and enjoyed baking it 🙂 Thanks so much! Thank you for this recipe! 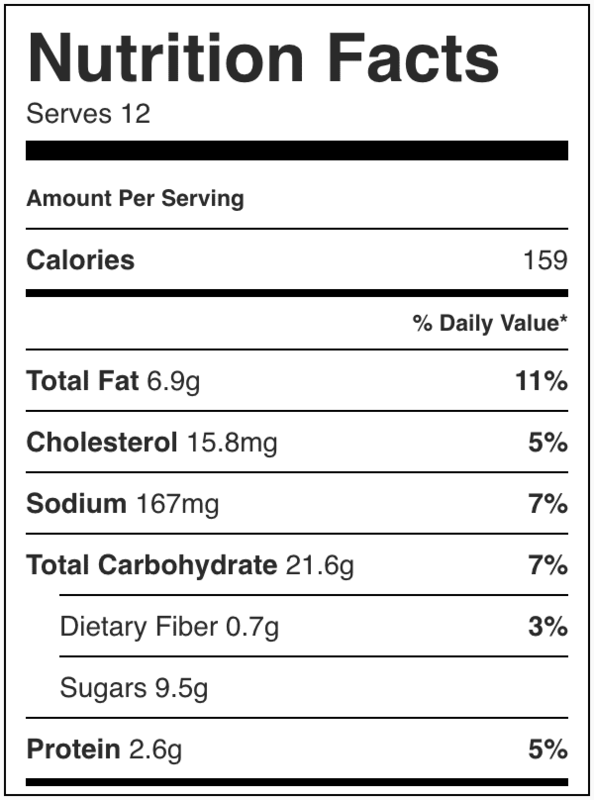 I love zucchini bread, but not all the extra calories and fat from the ‘dessert’ type. This bread was flavorful, moist and perfect in every way. I didn’t add the chocolate or any nuts. I did add an tablespoon of banana and an extra pinch left so of zucchini. Yumm! Just a thought, as I made this quickly and didn’t have time to read through like a good baker 🙁 But I added the zucchini before reading the part that mentions making sure it is thoroughly dried. Might be helpful to have this as a note in your ingredients section, and not after “Stir in zucchini’… Popped it in the oven just now, hopefully it doesn’t turn out to soggy!! Thanks for posting this recipe. I tried it today, but mine came out a bit too moist and oily. I think I can cut back on the coconut oil, since there is greek yogurt and bananas. I love the ingredient list, but it took a long time to bake for me…over 50min on 325 degrees…and it still came out a bit too moist. It was pretty tasty though. Thanks so much for your comment Elaine!! You can absolutely cut back on the coconut oil 🙂 I’m not sure if you did, but you could also try and squeeze out any excess moisture in the zucchini as that may be making your bread extra moist 🙂 Thanks for trying this recipe! UNBELIEVABLE!! It was SO freaking good. I made it exactly like the recipe said, but made two small loaf pans… one with chocolate chips one without. Both were delicious. I printed this out and will LAMINATE It it was so good. Heading to the store to buy another zucchini!! THANK YOU!! Haha this comment made my day!!! Thank you so much for trying this recipe and coming back to review it 🙂 So thrilled you loved this! This zuchinni bread is absolutely delicious! I’ve made it 3 times so far and by the 3rd time, used less sugar and a little more banana and it still turned out great! I’ve used chocolate chips 1x and walnuts the other 2x- all YUM! My family (3 kiddos- 7 yr, 5yrs, 3yrs and husband) can’t get enough! Thank you for sharing your recipes! Love this bread! Never had zucchini bread before. And it’s delicious! Also didn’t have bananas so I used yams! Which turned out perfectly. Have you tried coconut flour with this recipe or any of your others? Can’t wait to try this recipe! Zucchini bread with chocolate is my fav! Does this bread freeze ok? Would love to know if one could use rice flour instead of normal flour as my daughter is glucose intollerant. She is also lactose and sugar sensitive but can eat yogurt, could I swop the sugar for stevia or veg glycerine? Super excited to try this out in sunny South Africa!!! I’m sorry Marielle, I’ve never experimented with rice flour so I’m really not sure how it would change over in this recipe. Wish I could be of more help, but hopefully someone else can chime in! Just made this and it’s super moist and delicious! Made these yesterday for an office bake sale/baking competition. Everyone loved them and I won! They were moist and delicious- not to mention healthy! It’s a keeper for sure! I tripled the recipe and ended up using about 3 1/2 cups of zucchini and it was fabulous! Thanks for the amazing recipe! I just made this fantastic zucchini bread. It was my first time making zucchini bread, so I was a little worried (I’m not what one would consider a good cook). This bread was the moistest thing ever. I didn’t exactly follow the recipe to a T…… I’m just a rebel that way. I used a whole banana and a whole medium zucchini. I pulsed all of the wet ingredients in my Ninja, including the shredded zucchini which I added to the Ninja very last. Just poured the wet stuff on the dry stuff, hand mixed it a little bit, then baked. The bread turned out super delicious and it’s going to be quite a challenge to keep from eating it all myself! Absolutely delicious. I used buckwheat flour instead of white flour, coconut sugar instead of brown sugar & left out the chocolate chips – worked out beautifully. I’m always on the lookout for new healthy recipes & this one is a definite keeper. Can’t wait to try some of your other recipes. Yay! So happy you enjoyed this bread!! Thanks so much for the comment Kat 🙂 And I hope you love whatever you try next! I made the bread today…It’s AWSOME!!! I love the fact, that you cut out most of the fat and sugar, with healthier options. Thanks for that great recipe. I e-mailed the recipe to my sister in Germany. I will let you know how hers turned out. So thrilled to hear you enjoyed this recipe so much! Thank you for the sweet comment Renate! Hope you sister loves it as well! So I made this today, and accidentally made some changes. I doubled the recipie, used plain nonfat Greek yogurt, unpacked brown sugar, an extra egg yolk, a total of three cups of shredded zuchinni, no chocolate chips, a bit over half whole wheat flour, and completely omitted any oil. Baked it at 325 degrees in a 13×9 inch pan for 40 minutes. I was scared that I had changed it up too much, but it turned out great and even healthier!! Thanks!! Awesome!! 🙂 So thrilled it worked out well! Thanks for the comment Lisa! Thanks for this healthy zucchini bread recipe! I just made it today and it was delicious; my kids asked for seconds. I will definitely make it again. Made this last night and it is wonderful: great crumb, moist but not gummy or oily like many other recipes I’ve tried. I loved the spice from the cinnamon (and the ground ginger I added) plus the crunch from some chopped pecans. I omitted the chocolate and for once didn’t miss it. Will surely make this again!! Thanks for the recipe. I’m so thrilled to hear you enjoyed this bread! 🙂 And the ginger and pecan addition sounds amazing! 🙂 Thanks for the comment Heidi! I made this without the oil, used white whole wheat, and it was still very moist. Thanks for a great recipe. I’m thrilled you enjoyed this bread Drew! 🙂 Thanks for the comment! Wonderful taste and texture. I used one zucchini and one banana, adding extra flour for the extra moisture. I did have to bake it longer – maybe 20 min. longer – just kept checking and adding more time. So glad to hear you enjoyed this bread Sue! 🙂 Thanks for the comment! Chelsea, I just made this recipe and it is hands down the BEST zucchini bread I have ever tasted! I ground old fashioned oats into flour and used all purpose flour and walnuts i. I might try the dark chocolate next time. I am SOOOOO glad that I doubled the recipe. I know it won’t last very long!!! Yay!! That makes me so happy to hear Alice! 🙂 Thanks so much for the kind comment and review! I’ve made this recipe several times now. It is delicious and nutritious for me and my family. I especially like to keep it on hand for my 1 year old boy who eats it almost daily! The only thing I do differently is add an extra half cup of zucchini and I don’t squeeze the water out because I like it extra moist. Thank you for an awesome recipe!!! You are so welcome Kathleen! I’m so thrilled that you and your family have enjoyed this bread 🙂 Thanks for the comment and review! I am a regular baker but I’ve never baked with zucchini so I was a little scared. However, after reading all the great reviews I decided to give this recipe a try. Wow this zucchini bread is delicious and super moist and I love the fact that its healthy! The only thing I changed was I used 1/4 brown sugar and 2 tblsp pure organic maple syrup and 1 tsp nutmeg. Thanks for sharing your great recipe and I will definitely be making this again and again! This is definitely my go to Zucchini bread recipe! YAY!! I’m so thrilled to hear your first experience with zucchini baking was such a huge success! Thanks for sharing your adaptations and for giving this a try 🙂 I appreciate your comment Cristina! Just made this and it was delicious! I doubled the recipe and really wrung out the zucchini to get rid of any excess water. I love the coconut oil instead of butter and the greek yogurt to make it healthier. I added some chopped pecans and milk chocolate chips. It turned out so good. Mmmmmm…..
How can I substitute oat flour for all purpose flour? Is it a 1:1 substitution? How can I substitute sugar for honey? Will I need to adjust for the moisture? If I wanted to add less sugar/honey and more bananas, what proportions would you suggest? How can I substitute all purpose flour for spelt flour? I’m so sorry Rs, I can’t answer all of your questions because I’ve never tested these flours or sugar substitutes in this bread. I can tell you that oat flour and all purpose flour is not a 1:1 substitution; oat flour absorbs a lot more liquid than regular flour. I also know if you add more bananas you’ll have to compensate with more dry ingredients. Wish I could be of more help. I’ve tried some of your other recipes and they were great! This one looks really good, but I am wondering if I could I use almond yogurt instead. I like the Kite Hill brand as it has great taste and nice consistency. Also, would it be ok to only use oat flour? I’ve never experimented with almond yogurt so I’m not sure how it would work in this recipe. I do know that all oat flour doesn’t work unfortunately. Just made this and it is perfect, thank you for sharing your recipe! I am so pleased with this recipe! Turned out great!! Also worked well in muffin-form for events! I made this last night and it was wonderful! So easy too. To cut down a bit on the fat I replaced about 1/2 of the coconut oil with unsweetened applesauce. I used white whole wheat flour plus the oat flour. Also used plain greek yogurt but added extra vanilla extract (about 2 1/2 tsp total). I had 1/2 of a medium banana in the freezer so I used that instead of measuring out the 3 tbsp. Baked about 41 mins. All in all I’m shocked at how moist and delicious this turned out!! I’ve tried to make healthier quick breads and they always seem to be missing something. Not this one!! I shamelessly ate 1/4 of the loaf in on sitting! I’ve made this bread numerous times (added dark chocolate chips and walnuts) and it’s fantastic. Don’t over mix though or it will be dense (did that the first time). Question: I was thinking of substituting pumpkin for the mashed banana to make it more fall-like for a Thanksgiving dessert. Do you think that would work ok? So happy to hear you’ve enjoyed this bread! I’d recommend making this bread instead: https://www.chelseasmessyapron.com/the-best-healthy-greek-yogurt-pumpkin-bread/ Enjoy! So happy to hear that! 🙂 Thanks for the comment Shelly! I made this the other day, and it turned out great. Even my picky SO liked it. Because I’m a rebel (and didn’t have banana), I subbed the 3 tbsp banana with 3 tbsp unsweetened applesauce + 1 tsp ground flaxseeds (a common binding agent/egg replacer for vegan recipes is 1 tbsp ground flaxseeds + 3 tbsp water). I used spelt flour instead of ground oats and maple syrup instead of honey. Then I threw some chopped walnuts to the batter and sprinkled chocolate chips on the top. I’ll definitely make this again. I’ll try the ground oats next time, since they are cheaper than spelt! This stuff is so good!! And we even left out the brown sugar to make it a little more healthy!! And added a little nutmeg and all spice!! So yummy! Thanks for the great recipe! This was definitely the best zucchini bread I’ve ever made. I made it with tiny chocolate chips, which worked really well, and I used a full teaspoon of salt. So moist! It lasted less than 24 hours. Planning on making two more in the near future! I came upon this recipe today! My only tweaks were: half maple syrup, half unbleached sugar in place of the honey, I did half coconut oil and half olive oil, and semisweet chips. I added about a 1/4 cup whole milk to the recipe (which I quadrupled) in order to slightly thin the batter for muffins. I had enough batter for 24 muffins and a loaf pan. I baked the muffins at 325 for 25 minutes, the loaf took 55 minutes. YUM!! Big hit with me, my hubby, and my 20 month old daughter. Ahh those substitutes sound awesome! I’m so glad you guys enjoyed it! Thanks Amanda!